From brick to marble: Did Augustus Caesar really transform Rome? 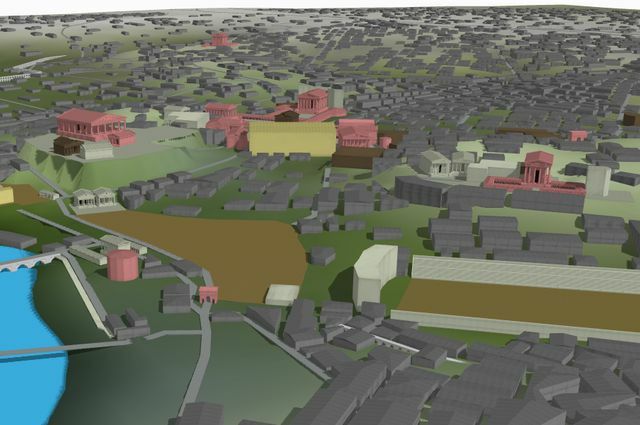 A computer model of Augustan Rome shows marble buildings in pink, buildings under construction in yellow, brick buildings in brown, white buildings in travertine and gray buildings as randomly generated infill buildings. 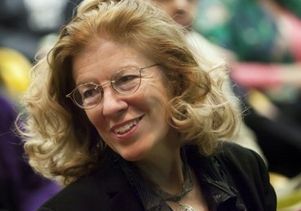 With degrees in Etruscology and Roman architectural history, Diane Favro has traveled to every corner of the Roman Empire, from Algeria to Germany to Lebanon, and written several books on the subject matter as well as worked on a long list of digital research projects that explore the ancient world. But the answer to one question about Rome during the reign of Caesar Augustus eluded and intrigued this UCLA professor of architecture and urban design. According to legend, the founder of the Roman Empire once famously boasted, “I found Rome a city of bricks and left it a city of marble.” Was he telling the truth or making an empty claim? Did Augustus really transform the eternal city from brick to marble, Favro wanted to know. 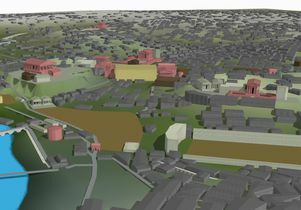 To find out, Favro decided to uncover the truth behind Augustus’ famous declaration by using advanced modeling software to reconstruct the city of seven hills in its entirety and observing how it changed during the period when he was in power. Favro has previously worked on digital projects that have focused on Rome as well as Karnak, one of the world’s most expansive temple complexes in Egypt. She helped develop The Digital Karnak, a comprehensive website that details Karnak’s political, religious and architectural history. 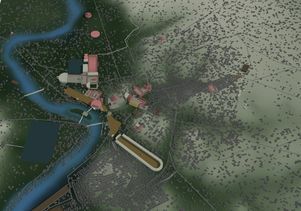 Working with her doctoral students Marie Saldana and Brian Sahotsky, Favro recreated Augustan Rome algorithmically using a technique known as procedural modeling. Scholars have tended to study the transformation of individual buildings in Rome instead of focusing on the transformation of the city as a whole because they lack the data needed to do so. While procedural modeling “has not been widely used as a tool to reconstruct ancient cities,” Favro said, it has been used by urban designers to create contemporary cities. The approach she used is based on rules for generating architectural forms. If Favro changes one rule in procedural modeling, the model of Rome will automatically regenerate, saving time and energy. “The model is changing all the time, and that fluidity gives it an experimental aura. Rather than having one beautifully rendered model that looks so good you never want to change it, you have a model that can easily be changed as new research takes place,” she explained. To further save time, Favro used massing models instead of hyper-realistic models to reconstruct the buildings, which involve a lot of hypothetical components and are highly labor-intensive. All of the buildings in the model are color-coded: Marble buildings are pink, brick buildings are gray and buildings under construction are yellow. Using a time slider on a working website that Favro and her team are developing, people can travel from 44 B.C. to 14 A.D. to see how Rome changed. So was Rome transformed into a city of marble? Favro now has a theory to explain this puzzling observation. But it was mostly an illusion, said the scholar. With the answer to her question in hand, Favro plans to continue refining this project. 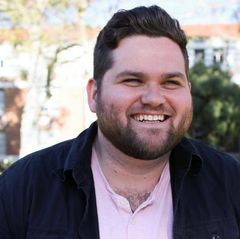 She will also continue to serve as the co-director of UCLA’s Experiential Technologies Center (ETC), a collaborative, interdisciplinary center that promotes experiential research in the digital age. This story was adapted from one that’s posted on the website for the Institute for Digital Research and Education. 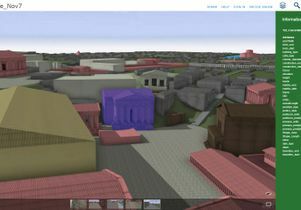 The computer model offers different views of Rome, including street views similar to those in Google Maps.